The Wildcat Sanctuary was notified by the state of Washington that they had two wild orphaned cougar kittens in need of a home – within a few days. Saving these two wasn’t even a question. We knew we had to step up and act quickly. We just received a couple of photos of them from the agency and, I’m sure you’ll agree, they melt your heart. Knowing what they must have been through already, the tragic loss of their mother, we can’t wait to make their lives stable, secure, and happy. Having raised cougars Andre, Carlo, Langley, Noah, and Donoma, who were also orphaned wild-born kittens, we know what’s in store for us. These cats are not socialized to humans. Rightfully so, they’re afraid of humans and it will take some time to reassure them that all humans aren’t bad. The female shows signs of a hip injury, but she seems to be recovering well. “Our first choice is that they both could’ve grown up in the wild. 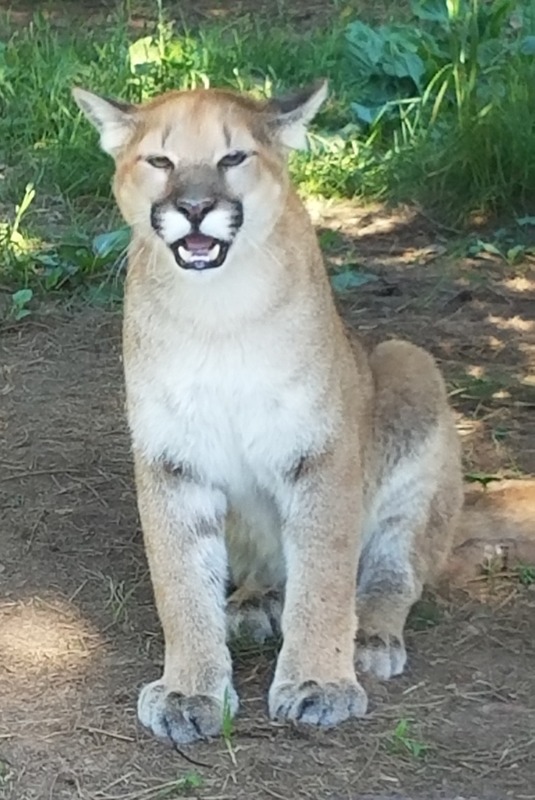 But, when that isn’t possible, we’re happy to provide them a second chance at life here at The Wildcat Sanctuary,” Director Tammy Thies said. Since cougars are opportunistic breeders, they will breed year round. Most likely, their mother was killed and the kittens were left to fend for themselves. The first kitten was found last week and the second sibling was spotted in the same area a few days later. That’s when the kittens were reunited. The Wildcat Sanctuary will be inviting the public to vote on the new names for the little ones over the next week. If you’d like to help us give them the ‘wild at heart’ life they deserve, please consider becoming their sponsor parent. You’ll find more information about our sponsorship program HERE or you can email us at info@wildcatsanctuary.org. OROVILLE – Three cougar kittens were captured by the Washington State Fish and Wildlife Department in the Oroville area last week, according to Sgt. Dan Christensen. The kittens, all weighing between 15 and 20 pounds, were captured between Nov. 29 and Dec. 1, one each day on Sunday, Monday, and Tuesday. Apparently, they had been eating the remains of deer parts that had been illegally disposed of in a box on the side of the road. They were all found between Hart and Gayes Point roads off County Highway 7, said Christensen, an agent with WDFW. “Animal Planet’s Rugged Justice had been in town filming when the cougars were being captured. The first cat, darted on Sunday, was suffering from injuries and had to be euthanized,” said Christensen. “We arrived on our last day of shooting a 10 day shoot with the Rugged Justice crew. One of the cougars I darted ran into Officer Justin Trautman who manually captured her. 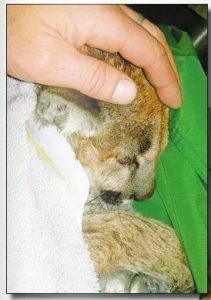 This cougar kitten had to be euthanized because of the open wound and shattered bones that were visible in the open wound. We never did locate the second cat I darted, nor the dart unfortunately. Brian Smith was the houndsman along with his son Hunter Smith, on Sunday,” said Christensen. 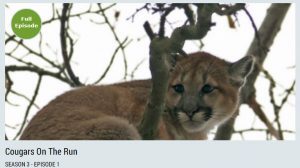 Rugged Justice left for Moses Lake on Monday and that day Oroville School District Superintendent Steve Quick reported that he observed two cougar kittens playing with each other on County Highway 7. Monday evening Officer Troy McCormick and the houndsmen responded to a report of a cougar sighted in town near Fifth and Ironwood streets. They were unable to tree the cougar and darkness hampered efforts. After filming the transfer of the cougar kitten from a bear trap to a transfer box Rugged Justice was going to follow Officer Christensen to Brewster on Tuesday to conduct an in the truck interview about cougar number two, a male. The dogs were not able to locate it initially and the group searched on foot and even tually Sharpe brought in another dog and they found the cougar in the river. The cougar was wet and part of the drug Fish and Wildlife uses lowers the animals’ ability to regulate body temperature. 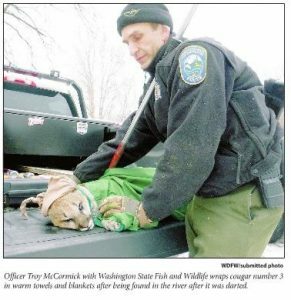 Officer McCormick used towels and blankets to dry and warm the cougar in his lap while using the blankets to direct air from his truck heater onto the cougar, who at this point was still sedated. He also heated a bottle of drinking water and used that to help warm her. The nearby homeowner brought out heated towels that he warmed in his dryer to help. The cougar was taken along with its sibling back to Officer Trautman’s and on Wednesday Officer McCormick transported them to bear and cougar specialist Beausoleil. 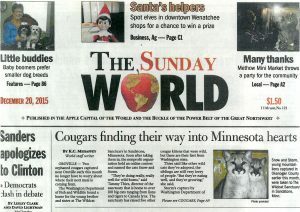 “As of now it looks like that cougar may be placed in a zoo in Minnesota. 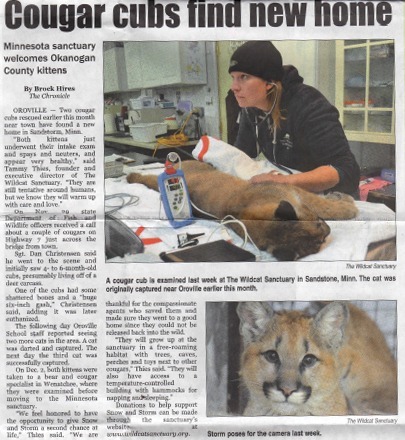 They are not suitable to release back in to the wild as their mom was unable to teach them how to hunt, among our public’s toleration in the Okanogan,” said Christensen. Christensen says he and his fellow WDFW officers are no longer wildlife control agents and do not trap nuisance wildlife. Rugged Justice was filming shots of the area on where the cougars were caught on Friday, as well as footage of the Similkameen for opening shots and ads for the show. They used a drone to film Christensen driving across the Similkameen River bridge as well as shots of the town. 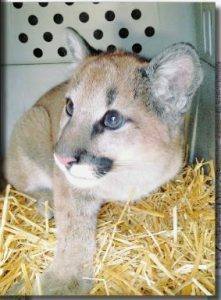 Above, cougar number 2, one of two female and one male kittens captured by the WDFW in the Oroville area. Above, left, cougar number three is warmed with blankets and towels, as well as a heated water bottle. Left and right, a crew from Animal Planet’s Rugged Justice uses a drone to film shots of the Similkameen River, the town of Oroville, locations where the three cougar kittens were found and Sgt. Dan Christensen with WDFW. Snow and Storm, young mountain lions captured in Okanogan County earlier this month, were taken to The Wildcat Sanctuary in Sandstone, Minn.
OROVILLE — Two orphaned cougars captured near Oroville early this month no longer have to worry about where their next meal is coming from. The Washington Department of Fish and Wildlife found a home for the young brother and sister at The Wildcat Sanctuary in Sandstone, Minnesota. Soon after taking them in, the nonprofit organization held an online contest and named the cats Snow and Storm. “They’re doing really, really well for wild-borns,” said Tammy Thies, director of the sanctuary that is home to over 100 big cats ranging from lions and tigers to Canada lynx. 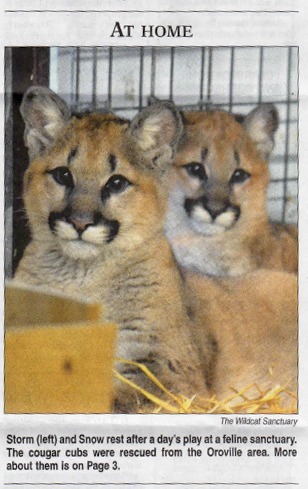 The sanctuary has raised five other cougar kittens that were wild, but these are their first from Washington state. Thies said like other wild cats they’ve adopted, the siblings are still very leery of people. “But they’re eating well, and they’re growing,” she said. Storm’s capture by Washington Department of Fish and Wildlife officers included being chased out of a fenced yard, shot with tranquilizer darts, and running smack into an executive producer from Animal Planet, who was in Oroville to film the real-life stories of Wildlife officers. Snow’s experience was even worse. She was treed by a local dog, shot with tranquilizers, then chased by trained hounds into the Similkameen River, where Fish and Wildlife officer rescued her from the mouth of a hunting dog. A third sibling was euthanized due to a previously injured leg. Thies said Snow and Storm are staying together in an indoor quarantine for 30 days, to ensure they don’t have any parasites or diseases that can spread to other cats. This weekend they’ll be neutered, examined for disease, and Snow will be X-rayed to see if a hip injury she got during her capture needs medical attention. Soon, they’ll have access to an outdoor area that’s still separate from the other cats, but where they’ll be able to see other felines. “Our goal is to raise money to build a free-roaming area, about 20,000 square feet,” Thies said, noting any funds donated in their honor will go toward their care and habitat. The Wildcat Sanctuary was formed to take in captive wild cats longer wanted by their owners. It later expanded to include wild cats that could not be returned to the wild. Wildlife officials don’t know what happened to Snow and Storm’s mother, but said said they were not old enough to survive on their own, and could not be released later without having learned hunting or survival skills from their mother. People can donate toward their care, or check on blogs to find out how they’re doing by visiting wildcatsanctuary.org. Reach K.C. Mehaffey at 509-997-2512 or mehaffey@wenatcheeworld.com. Read her blog An Apple a Day or follow her on Twitter at @KCMehaffeyWW. 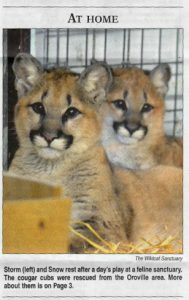 OROVILLE – Two cougar cubs rescued earlier this month near town have found a new home in Sandstone, Minn.
On Nov.29, state Department of Fish and Wildlife officers received a call about a couple of cougars on Highway 7 just across the bridge from town. Sgt. Dan Christensen said he went to the scene and initially saw 4- to 6-month-old cubs presumably living off of a deer carcass. One of the cubs had some shattered bones and a “huge six-inch gash,” Christensen said, adding it was later euthanized. The following day Oroville School staff reported seeing two more cats in the area A cat was darted and captured. The next day the third cat was successfully captured. 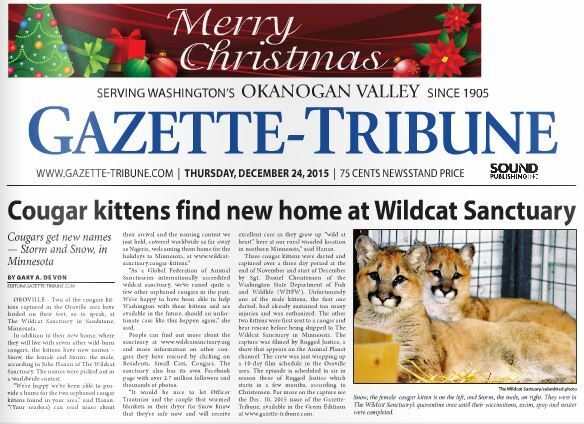 On Dec. 2, both kittens were taken to a bear and cougar specialist in Wenatchee where they were examined before moving to the Minnesota sanctuary. Introducing brother and sister Snow and Storm to brothers Aspen and Blaze so they could form a new family unit has gone very well. They’re all living together and their individual personalities are really blossoming, thanks to the patient positive behavioral techniques our caretakers have used to help them learn to trust humans after such a tragic start in life. Blaze is the boldest and most dominant of the group. He’ll approach to check out what caretakers are up to and loves scents, toys, and ripping up grass to toss about. His brother Aspen, though, is the least dominant. He enjoys hanging out on the high platform in their habitat with Snow, the only girl of the group. Storm’s been seen pushing Blaze out of the way for a favorite toy he might like and loves rolling in the scents we sprinkle about their habitat. Snow usually hangs back to let the rowdy boys eat first and shows impeccable manners. Seeing them playfully chasing each other, enjoying toys and enrichment is such a positive sign. They’re finally feeling this is home and they’re safe. We look forward to watching them grow into strong, healthy, confident cougars – just as their mothers would have wanted.